It happened shortly after 8:00 p.m. on the evening of Wednesday, May 11, 1960 just off Garibaldi Street in the Bancalari district of Buenos Aires. Ricardo Klement – a non-descript, balding man — stepped off a bus and walked toward his home. As he passed a seemingly disabled Buick, Klement heard a man say “just a minute” and turned to see the man leaping at him. As the two struggled they toppled down a ditch before Klement – aka Adolf Eichmann, the engineer of the Holocaust – was subdued. The next stop for him was a trial in Jerusalem and, thereafter, a June 1, 1962 date with the gallows. There is, no doubt, an irony that it was to Argentina that Eichmann chose to flee. By the time he was captured there were over 275,000 (some say over 300,000) Jews living in Argentina out of a total population of twenty million. It was the home of the largest Jewish population in Latin America, at the time the seventh in the world. While Jewish immigration to Argentina began as early as the Sephardic expulsion from Iberia, it was not until Argentina gained its independence from Spain in 1816 that Jewish immigration from Europe picked up pace. Russian Jews escaping pogroms arrived in 1889 and became gauchos (Argentine cowboys), establishing a colony called “Moiseville” on the Pampas. In the early years of the 20th century there was a steady wave of European Jewish immigration to the country leading to a population of over 200,000 Jews by 1920. While another wave of immigration occurred after World War II, the rise of Juan Perón – and particularly the chaos unleashed in the wake of his fall – started a wave of Jewish migration away from Argentina. Today there are approximately 250,000 Jews in Argentina – down from a high over over 300,000. It is currently the sixth largest Jewish community in the world. The overwhelming majority of Argentine Jews are in Buenos Aires, though there are also Jewish communities in Rosario, Córdoba and Santa Fe. Buenos Aires has a highly active Jewish culture with synagogues, schools, kosher restaurants and the sorts of Jewish institutions one would expect to find in hubs of Judaism like New York or London. It even has the only kosher McDonalds outside of Israel. While Argentina’s foods are as varied as its peoples, there are two things that come to mind immediately about Argentine cuisine: Pampas beef and empanadas. The later are Argentina’s take on the classic notion of serving a protein wrapped in dough for easy transport. Indeed the word “empanada” is derived from the Spanish verb “empanar” meaning “to wrap in bread.” Argentina’s classic empanada – the best seller on Buenos Aires streets — uses their famous beef in ground form often accompanied by funky ingredients such as olives and capers and even, sometimes, raisins. And that was the model for this dish. I, however, prefer the feel of hand-minced beef to that of ground. It gives the dish more of a meaty texture. 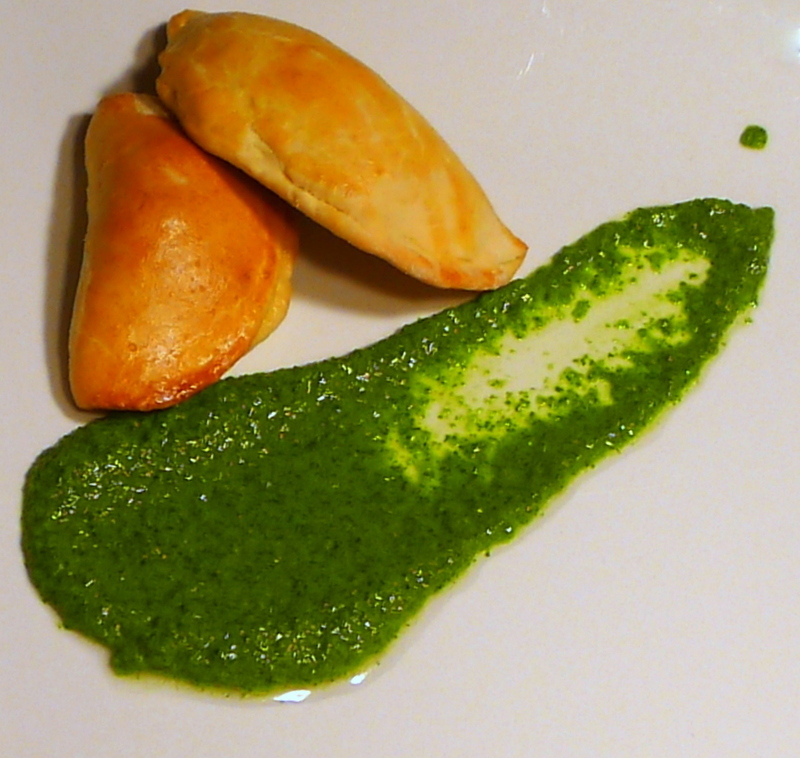 And pairing it with Argentine beef’s classic accompaniment – chimichurri – was a natural. While Argentine chimichurri is chopped, not puréed, I went with the later approach so that the sauce clung more effectively to the empanada. 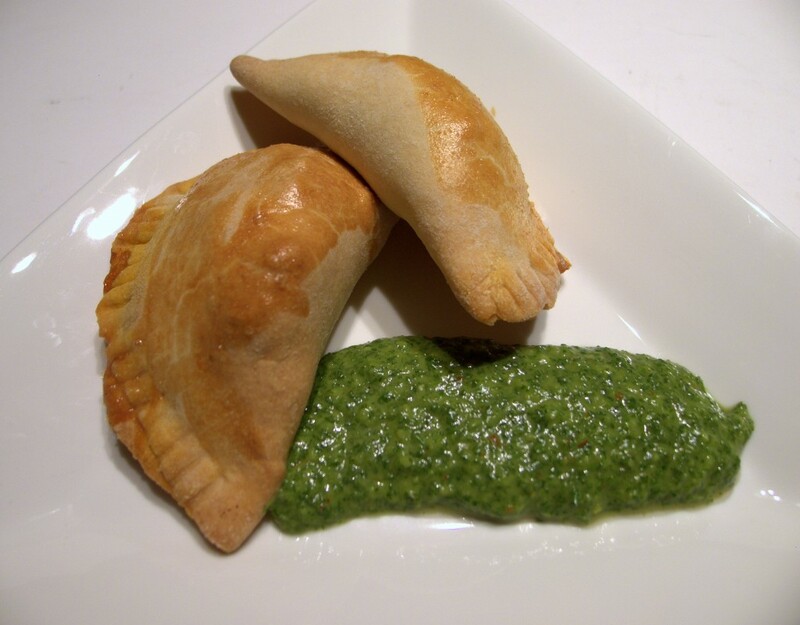 The resulting dish, while not exactly a classic Argentine empanada – kosher, slightly modernized and all – is not entirely unlike that which Eichmann might have gotten had he stopped for some street food before getting on that bus that momentous day. Make and rest the dough. Sift the flour along with the salt and baking powder into a large bowl. Work the butter into the dough using a food processor fitted with the metal blade until the mixture is the texture of coarse meal and has only a few remaining small lumps of butter. Add the 2 eggs, milk, and vinegar and run the processor until the mixture becomes a well-combined dough. Flour your hands and shape the dough into a ball, placing it on a lightly floured surface. Knead the ball gently a few times then wrap it in plastic and refrigerate for an hour. Prepare the filling. Meanwhile, add two tablespoons of olive oil to a sauté pan over high heat. When the oil is hot brown the beef in the pan on all sides. Transfer to a work bowl. Add another tablespoon of oil and, when hot, add the onion and cook until it softens but does not brown, about five minutes. Add the tomatoes and cook down for about two minutes. Stir in the spices, capers, olives and parsley. Season with salt and pepper, to taste. Reduce the heat to low, return the meat to the pan, stir in the egg and heat just until warm. Remove the filling from the heat, transfer to a work bowl and refrigerate until cool, about 15 minutes. Make the Chimichurri sauce. Preheat oven to 350° Fahrenheit. Meanwhile, add all of the ingredients except the oil to the work bowl of a Vitamix, other high speed blender or food processor. Process the ingredients on low speed to combine them, then turn the speed to high. Drizzle in the oil until fully incorporated. Check the seasoning and adjust to taste. Make the empanadas. Remove the dough from the refrigerator and separate it into golf ball-sized spheres. Take a gallon zipock-style freezer bag, cut the top off and open each of the sides. Place the bag in a tortilla press, the open side out, and place a dough ball in the middle of the bag. Press the ball into a flat disk. Add one to two tablespoons of filling in the center (the exact amount depends on the dough’s size) and fold the circle into a half moon. Pinch and fold the edges to seal them (crimping with a fork if you like) and place the formed empanada onto a prepared baking sheet. Continue to do this with the remaining dough and filling. 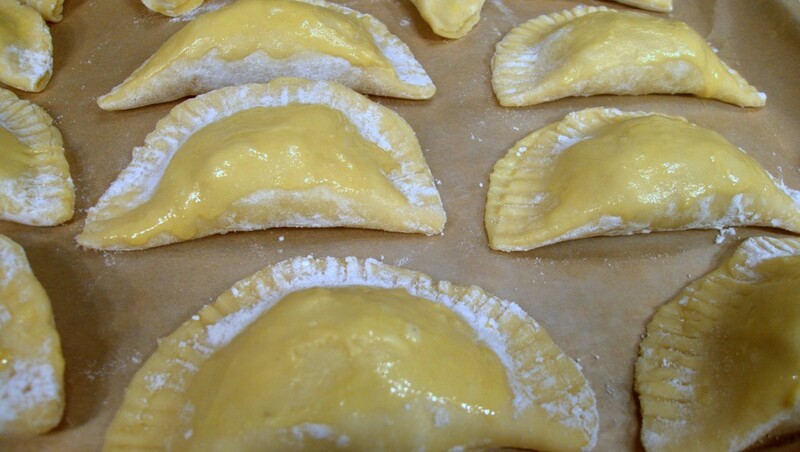 Brush all the empanadas with egg wash. Bake the empanadas until golden brown, approximately 25 minutes. Plate the dish. Arrange two empanadas, leaning up against each other on one side of the plate. Swipe a pool of the sauce across the bottom of the plate.